This French-inspired steakhouse soars above downtown LA, and offers high-level cuisine to match. Open Wed.-Sun. 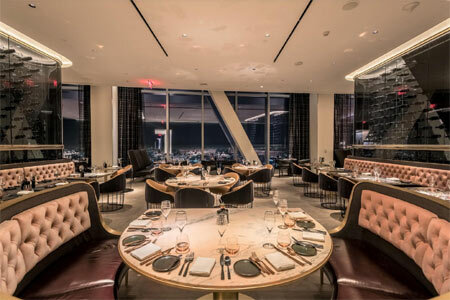 5 p.m.-10 p.m.
About the restaurant: With the name, it is easy to understand that the restaurant is French influenced, a steakhouse ("butcher shop" is the direct translation) and located on the 71st floor. As soon as you enter La Boucherie on 71, it is obvious that the property's goal is to make this restaurant its flagship, but also to put a mark on the culinary map of the City of Angels --- and when we say culinary we mean the upper end of the quite large LA food scene spectrum. 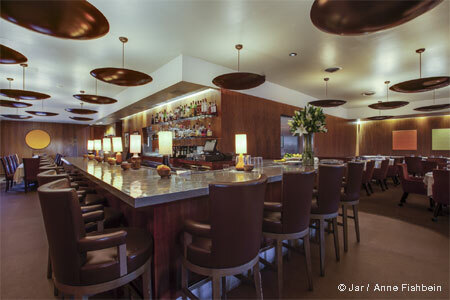 The floor-to-ceiling windows let you be part of what is going on down below outside wherever you are seated. This is one of the highest views in the city as the building, Wilshire Grand Center, is the tallest building in America west of the Mississippi. One of the private tables even has a corner view! The décor is a mélange of French élégance, which for some reason is based on Queen Marie-Antoinette, as visible in the love seats and the back of the banquettes, and modern America. Every part of the experience has been carefully orchestrated, including Lalique crystal, elegant dishware and silverware, a choice of 10 different steak knives brought to the table, 15 mustards, eight salts, a backlit menu (so you can actually see it), an electronic wine list, wood floors reminiscent of Versailles, and a beautiful bar where fresh herbs and fruits are lined up to prepare craft cocktails. Despite the luxury of the lieu, there are no tablecloths but rather three different tabletops: black marble, beige marble (for the chef's table) and black wood. Likes: The food, the view, the wine list. Professional service. Dislikes: Not recommended if you have vertigo! Watch the hotel opening party. About the chef & the food: Now it is time to sit and discover the menu composed by chef Alessandro Serni. Brush up on your French because most of it is written in the language of Molière. Even if Serni is half Italian and half Spanish, he does not have any problem navigating in the French repertoire, adding personal and creative touches. His "Oysters & Foie" are raw oysters in their shells swimming in a foie gras soup topped with a balsamic-infused strawberry. That alone is worth the trip (and should never be removed from the menu). The frog legs are stuffed with meat and herbs and served on a lemon brûlée. Bien sûr, there is a bouillabaisse served with its inseparable rouille, as well as French onion soup au gratin and filet mignon tartare. For the foie gras torchon accompanied by Sauternes gelée, Port chestnut honey, Serni used the Hudson Valley Foie Gras Grade A so masterfully that it is one of the best preparations we ever tasted. You will be baffled when you see what is being offered in the "Traditions Françaises" section: rognons de veau Cognac (veal kidneys), pheasant confit, perfectly executed tripes à la mode de Caen, and a very daring, but very good, combination of ris de veau (sweetbreads) with chanterelles, peas and black cherries. And you thought you were coming for a steak? Well, then let us indulge in one of the eight proposed cuts of Prime American beef, unless the "Guillotine Cut" (poor Marie-Antoinette) with A7 or A5 Australian Wagyu catches your attention. Other options include rack of lamb, tournedos Rossini, venison loin and bison filet. For those who prefer the sea, you can order a plateau de fruit de mer ($165 shellfish platter that requires 25 minutes of preparation), halibut or turbot. Don't forget to choose a sauce and side dishes (duck fat fries, pommes Anna, heirloom carrots Vichy). Do as the French: it is NOW the time to have some cheese. We suggest you pay a visit to la cave à fromages before ordering. You cannot leave before having at least the chocolate soufflé. And if you still have an appetite, order the black truffle crème brûlée or the crêpes Suzette. About the wine: You should also ask wine director Szymon Piechaczek to walk through the wine tunnel that contains over 1,200 labels. Naturally, the focus is on French wines, including a $22,557 1979 Domaine de la Romanée Conti "Romanée Conti," which should clue you in to the quality of the wine program.